The desk sized ruled planner has a small calendar and an unlabeled box. The older version of the planner is at the bottom of the page. The newest version [as of 2010] includes more options. The file that has the calendars contains all 12 months. Additionally there are two coordinating ruled pages, one with the boxes and one without the boxes. If the same month is printed on both sides of one sheet of paper, you will have 4 pages for each month. 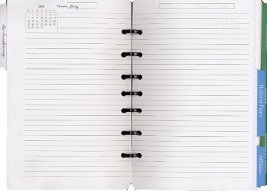 The ruled paper can be printed back to back to use as filler between months or placed in a Notes or Journal section of your planner. See how I am using the Half-sized Ruled Weekly Planner as a garden planner. Ruled Paper Coordinated with "This Week"
This planner is very much "Do it Yourself." You have to choose which files to print, explained below. You have to write the month and year on the printed file. In order to choose, you have to look at a calendar and look at these two things: The first day of the month (Sunday or Monday or Tuesday...) and how many days the month has. Remember, The week starts on Sunday. The files are linked in the table below. Choose based on starting day and number of days. This planner is very much "Do it Yourself" in the same way the one above is. I made a new handwriting paper set - "2012 Set". The set includes rule sizes from 1" to 1/4" in 1/8th" increments in both fully ruled and blank-top. The 1/4" rule also comes in a "booklet". I added one more size - 1/4" Tall, a rule size that allows one to write tall uppercase letters.